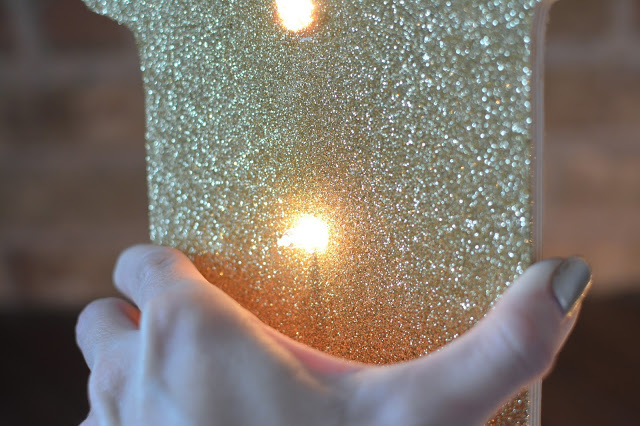 I have a small addiction to things that light up and that are shiny…. 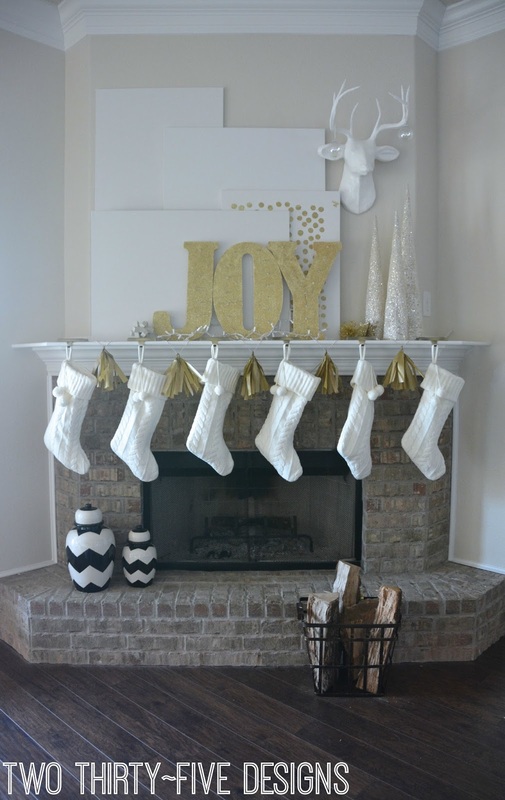 I knew I wanted to keep our mantel clean and simple this year. 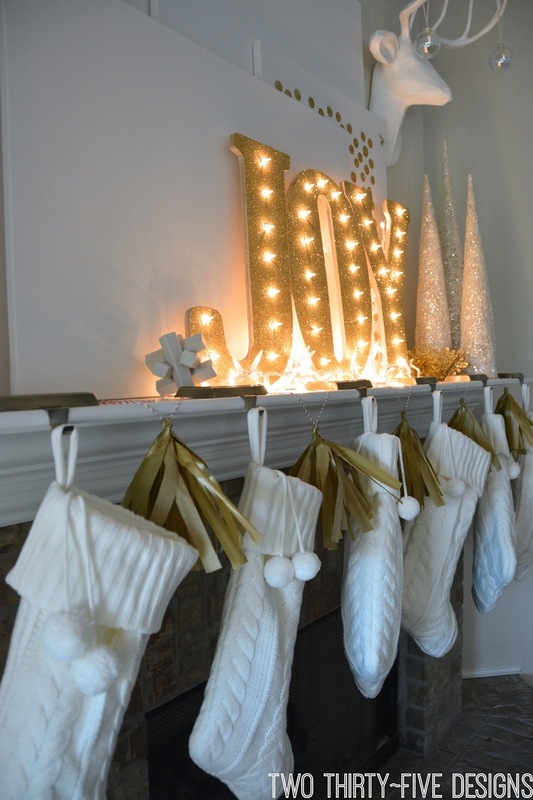 Even ditch the traditional garland. Gasp…did she just say that? Yes, yes I did. I was going to reorder the same stockings that we used to have from Ballard Designs, but as usual I waited and wanted some pronto, like 5 minutes ago. I saw some in Target and snatched them up and knew where I wanted to go with it. 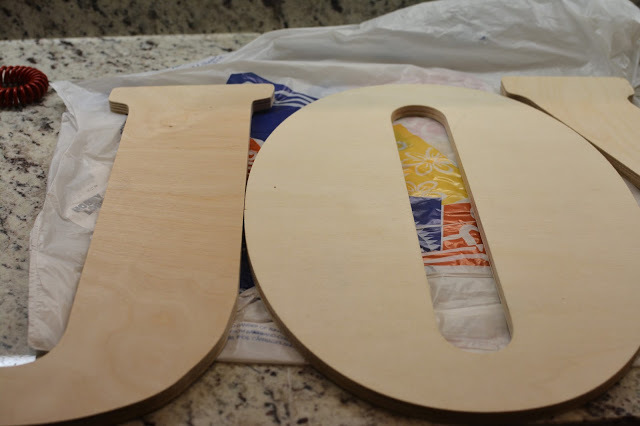 Then headed over to Hobby Lobby and grabbed three wooden letters. 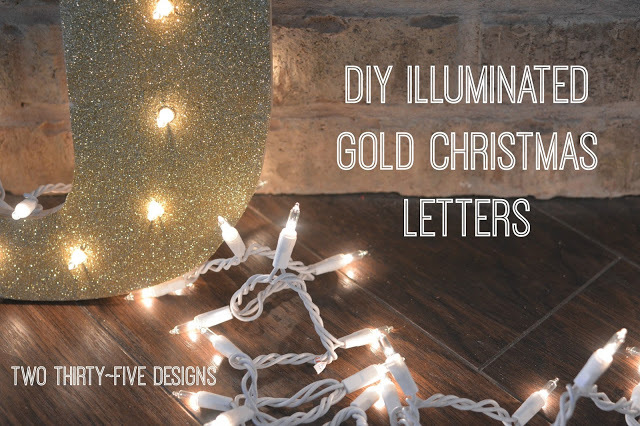 They are 12.99 a piece, but when you catch them on sale, or use your coupon, you can have a great project for less than $30. And can finish it in less than an hour. We had finished putting up most of the Christmas Decor and everyone was in bed….finally. 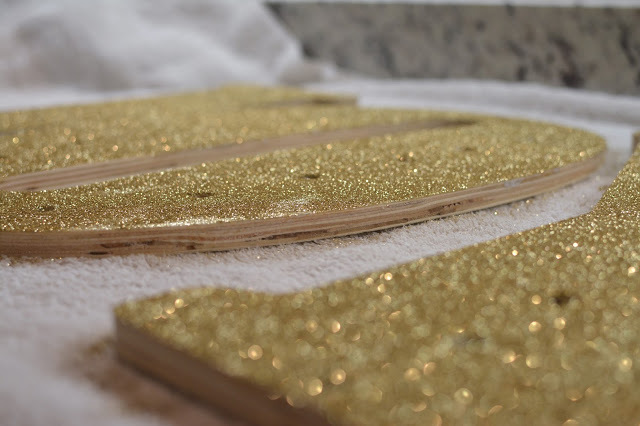 I finished SNL and was about to head off to snoozeville and had the thought that if I would at least put the glitter on, it would be dry by the morn and I could finish the mantel….ahem. 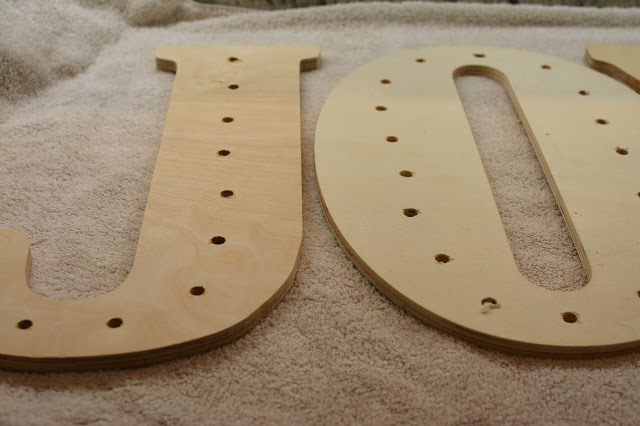 Originally I was going to glue the letters together and put a dowel in the back so they could stand on their own. Scratched that at one in the morn and decided they could just lean against each other. Quickly stretched out the string of lights and marked off where a hole needed to go. 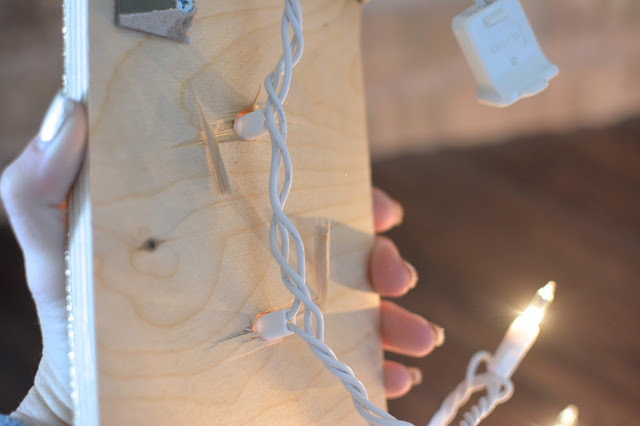 Plan out what side the lights need to be plugged in on and how much you need to stretch out. 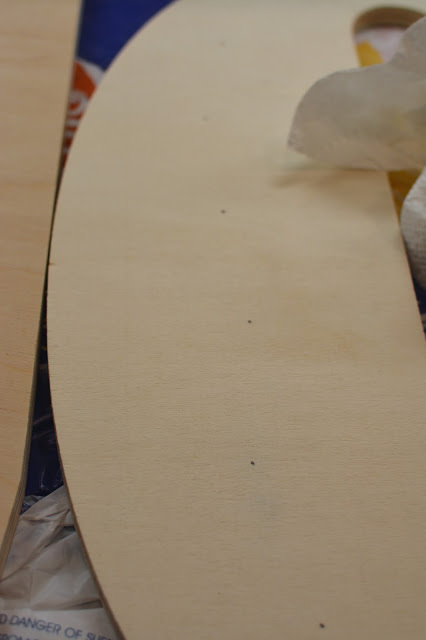 Drill your holes with a bit that is just slightly bigger than the base of the light, not just the tip or the bulb. You want the entire light to slide through, down to the wire/bottom of the plastic base. 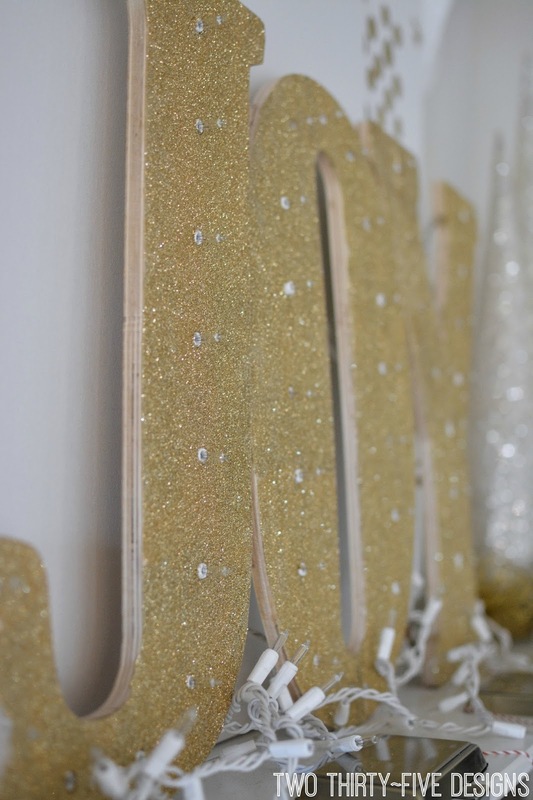 Modge Podge and Glitter the heck out of the letters. It is better if you are working in sections on bigger letters, the modge podge will dry before you can get the glitter on if your areas are too big. Let it dry and touch up if necessary. 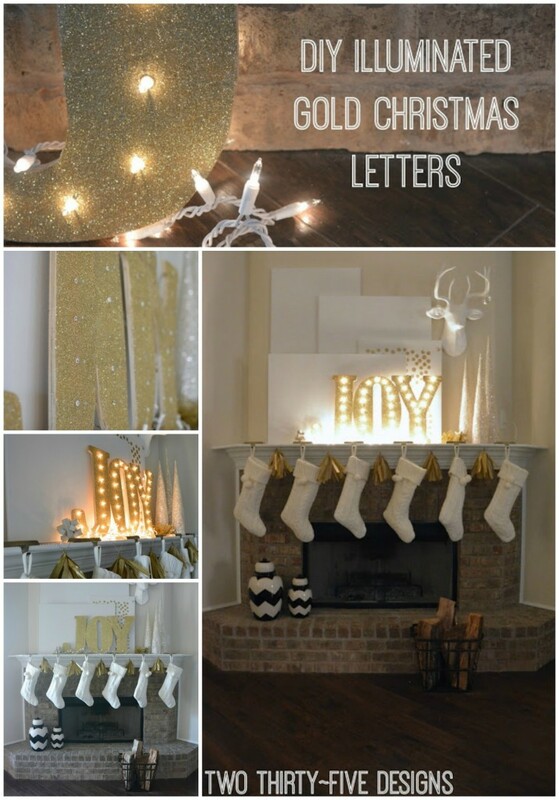 Run your lights through, making sure to push in all the way to the bottom. I didn’t have to tape down the lights on this project, like I did on THIS PROJECT, they were tight enough. I just leaned them against the gawd awful unpainted canvases….I knew I should have tackled that months ago…le sigh. At first I was going to hide the excess lights and cords behind the canvases, there is a plug behind them. But I had to pull them down every time, which ended in a gold dusted scalp. So I piled them around the letters while I figured it out and I kinda dug the glow that they make at the base. 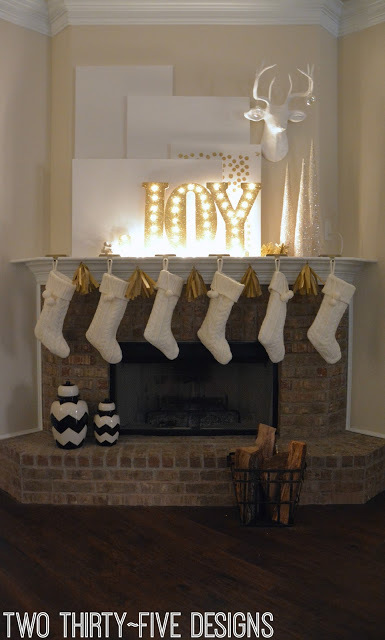 I opted to use the outlet on the side of the fireplace, even though you can see it. But it sure is a heck of a lot easier to plug in and the kids can turn it on without me worrying. 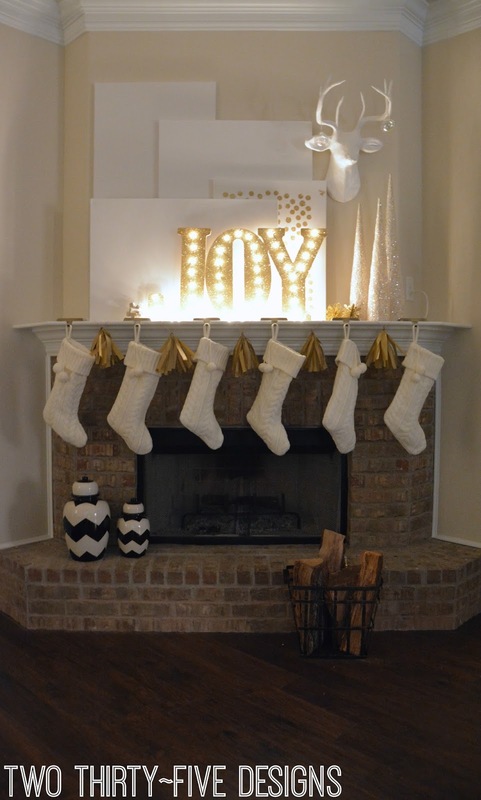 I also decided to make a fast tassel banner (how to HERE) with gold tissue, to fill in the gap between the stockings. thank you caffeine, thank you. It just has a clean feeling and still dig it during the day when it’s turned off.